Amazon.com offers the OXO Good Grips Grout Brush for $5.99. 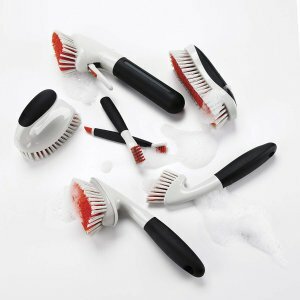 Features: The OXO Good Grips Deep Clean Brush Set features two brushes for easily scrubbing all the hard-to-clean places where dirt builds up. Both Brushes feature sturdy nylon bristles and soft, comfortable non-slip grips. The Large Brush is sized and angled perfectly for scrubbing grout, shower door tracks and more.